The owner of Otter Bay Wetsuits has prided herself in manufacturing custom suits since 1987. 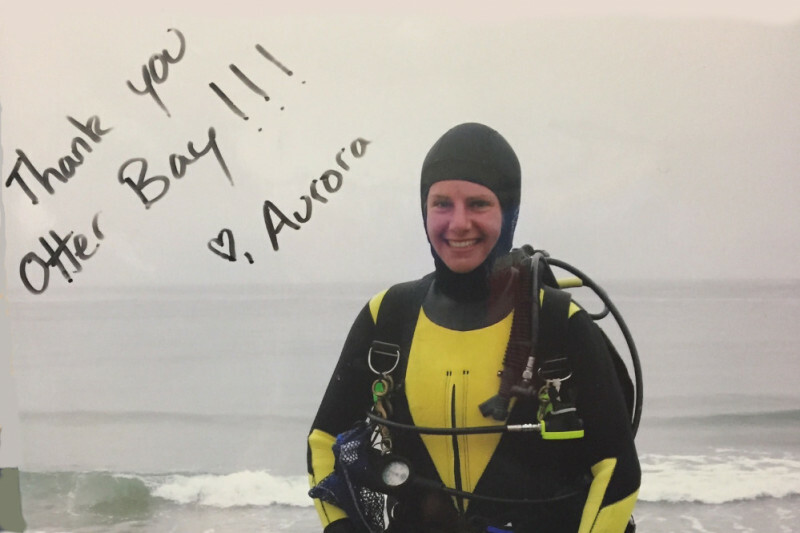 In 2001, we began an annual wetsuit giveaway, benefiting the local marine science students. Here in Monterey, we have six institutions who participate every year. At the beginning of the school year, applications are sent to the instructors/diving safety officer and with that, they each select their most deserving student who’s studies can benefit from a custom wetsuit. The student then has until the end of December to fill out and return the application, telling us of their classes and how they will benefit in the future from those studies. Within the first ten days of January, we make the difficult decision as to who receives that custom suit. It is a very difficult decision with desires to make a suit for everyone we get an application from. But being the small company we are, it is not possible to do so. On occasion, we’ll give two suits away when we just can’t make a decision. Occasionally, we will get a sponsor who pays for another suit, and our second place winner will come in to get measured. What we would love to do is expand our program and give suits away throughout the year. Not only to local students in the Monterey area, but to others up and down the coast. Not just in California, but up into Oregon and Washington. as well. Maybe even further. Each custom suit is made with about 60 measurements, with which a custom pattern is made from scratch. From that pattern, a suit is cut out, assembled and finished. Our seams are glued, sewn and guaranteed for the life of the suit. Our goal here on Go Fund Me is to raise the money that will help us to offer more students the suits they need to continue their studies without having to get out of the water just because they are cold. We know from experience that a good fitting wetsuit will help in their studies, as they won’t need to concentrate on their own warmth. Many of them are renting suits or using a suit that they bought off the rack, neither of which fit them well. Our most popular suit is a seal neck jacket and farmer johns, which keep the students the warmest. With every $500 raised, we will be able to give another suit away. With continued support, we can give more applicants a custom suit. And, we can give them year round rather than the once a year that we are doing now. Any donation will be greatly appreciated, small or big. Alright, time for the 2018 giveaway. Just sent out the applications. Hoping we can give a second suit out as we did last year with the donations here and in the shop. Let's make it another great year for our students. Time to send out our 2018 applications for this year's Marine Student Wetsuit Giveaway. For every $500 raised, we will be able to give an additional suit to our runner ups. We than those who have helped us give a second suit last year. THANK YOU, CRICKET!! I'm so thankful to have been chosen for a custom suit thanks to the Go Fund Me you've started. I'm looking forward to meeting you too! And I will shout from the rooftops about the Go Fund Me page you have so other students can receive this amazing gift as well. Thanks to our donors we were able to give a second suit away for the 2017 wetsuit giveaway. Looking forward to being able to do the same throughout the years. Your help makes it all possible to make it easier for these students to concentrate on their marine biology studies. More people need to be able to get in the ocean! Thanks Otter Bay for all you do! As the lucky recipient of an Otter Bay wetsuit when I needed it most, I'm so glad to see the program continuing! This suit lasted through years of subtidal research and instructing classes. Thank you Otter Bay Wetsuits!